Don't do I need some GPIO pins for the audio? Yes, for pwm or i2s, don't see how that's related here. I got my BW screen today... Didn't even look at the box before I opened the case. I don't think I will be able to use it on my upcoming gameboy zero build, since they sent me what looks like the 5" version. Does anyone have experience with this screen? So mad at Amazon. If you look at the label on the box it says 3.5” but the box itself lists sizes 3.5-5” super sucky situation. 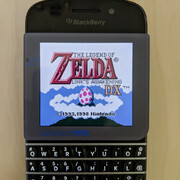 This is the same screen that is being used in the pocket Pi FE. I just want to use it without any aio board. I guess I need a breakout or driver board? Everything I seem to find is referring to the ILI9341. Hey you are in luck, I have a breakout for this LCD on my GitHub. I don´t know if this is the right thread (please move if not), but I wanted to share what can become a very long term project of mine. But the problem is that the software support is a bit lacking (BB10 + Retroarch is already a bit outdated). 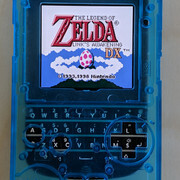 So, next thing could be to either connect the Q10 screen to the original GBC hardware (seriously), or better yet, connect it to the Pi Zero (also seriously). As said before, this can turn into a very long term project of mine, and maybe Nintendo comes with a GB Classic in the meantime, but I'm decided to learn everything required. It fit´s perfect in the original DMG01 case. It runs at 5V, so no mod is needed.